CrazyCrypt Ransomware is a malicious application that shows a red warning message asking to write to crazycrypt@bk.ru. Sadly, before displaying the notification, the malware should also lock various files located on the infected device. Consequently, the marked data becomes unreadable and useless without decryption tools. Of course, the hackers promise they will be restored once the user pays the ransom, but in reality, the cybercriminals might not hold on to their word. This is why we would advise thinking twice before deciding what to do. It seems to us if you do not want to risk being scammed, the best option would be to erase CrazyCrypt Ransomware and then restore files from backup copies. Even if you did not make any copies intentionally, you could still have them, for example, photos uploaded on social media platforms, and so on. To learn how to remove the malicious application manually, you should check the instructions located below. In the rest of the text, we would like to discuss CrazyCrypt Ransomware in more detail. It might not seem important how the malware is spread if your computer is already infected with it. However, knowing how it enters the system is crucial if you wish to avoid similar threats in the future. Our specialists say this infection should be spread like most of the other ransomware applications. With malicious email attachments, installers, updates, and other files obtained from unreliable sources, for example, Spam emails, file-sharing web pages, etc. It means to avoid such malware, users should stay away from content if they do not know it is safe to interact with. To be entirely sure it is best to scan suspicious files with a reliable antimalware tool first. After entering the system, CrazyCrypt Ransomware may try to create a few Registry entries to block antimalware tools as well as the system’s security tools like Windows Defender. Next, it is supposed to block user’s Task Manager, Command Prompt, Registry Editor, and other important tools. Most likely, the threat does so to stop the user from removing the malicious application and interrupting the encryption process. Once the files are affected they should have a specific long extension, for example, in our case it was file.docx.id. EA711283.[crazydecrypt@horsefucker.org].crazy. 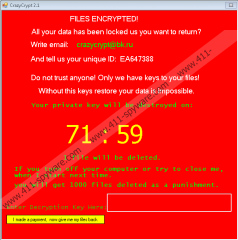 Then, CrazyCrypt Ransomware should display a red warning message with a timer. It explains what happened to the victim’s files and that only the malware’s developers can restore them. To contact them there should be an email address (crazycrypt@bk.ru). The ransom note says the user would have to pay, but it does not name the price. Also, to rush the user into emailing the hackers and making the payment the warning may claim some files will be erased for good if the threat's creators do not get paid until the given time runs out. The files that got encrypted might be valuable or precious to you, but you have to think about whether you are prepared to risk losing your money in vain. There is such a possibility since the hackers cannot give you any guarantees, as anything they promise could be a lie. In case you choose not to risk your money and delete CrazyCrypt Ransomware we can offer you the removal instructions located below. Of course, if the process looks too complicated, you should not hesitate to use a reliable antimalware tool instead. All you have to do is reboot the computer in Safe Mode with Networking and download the chosen tool. Tap Win+I or go to your Start menu and click the Power button. Press the F5 key and reboot the system. Find a malicious file downloaded before the malware appeared. Find a value name titled DisableAntiSpyware, right-click it and press Delete.